You can call us all day, regardless of our opening hours. If we do not pick up the phone, we will call you back. We are situated in Prague 4, four minutes on foot from Budějovická subway station, in a street linking Budějovická and Pankrác stations. Our salon is located on the first floor. There is an elevator. Do you have employee benefits? We accept Sodexo, Chèque Déjeuner and Edenred employee benefits vouchers. We also accept payments through the Benefity.cz, Benefit Plus and Gallery Beta systems. We do accept credit cards. If you prefer to pay cash there is a Fio bank ATM next to the entrance to our salon. Kiwi Thai massage salon is located	at Budějovická subway C line (the red one) station. It will take you four minutes on foot to get to us. Use the exit to Olbrachtova Street, i. e. the one without escalators, with a solid staircase and an elevator. After leaving the subway area, walk up the stairs that lead you under the building of Raiffeisen Bank, and turn right. After a few steps, you will reach the main street of Budějovická, in the center of which is a car park. Turn left and keep walking up this street for about three minutes. When you have passed Albert Supermarket on your right, cross the street, and you will see a multi-storey building – this is where our salon is located. You can also get to Budějovická station by bus. You can use the following	bus lines 118, 121, 124, 170, 193, 205, 293, bus lines BB1 and BB2 from the office complex BB Centrum Brumlovka, and many other suburban bus lines. Our Kiwi Thai massage salon is located near to two main Prague roads – the Jižní spojka (Southern Ring Road) and the Severojižní magistrála (North-South Highway, 5. Květen Street). From the	Jižní spojka you can use the exit in Kačerov or at McDonald's restaurants. From the	Severojižní magistrála you can use the exit into Vyskočilova Street (near the business center of Brumlovka). 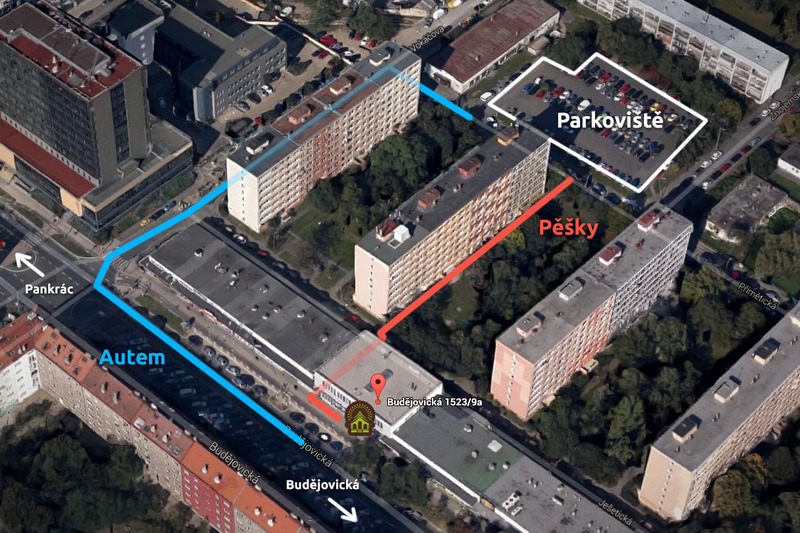 Our salon is in Budějovická Street which connects Budějovická and Pankrác subway stations. If you use the aforementioned exits, you will find us on the right side of the street. Parking is free during weekends and after 8 PM in the residential zoned parking spots in the surroundings of our spa. On weekdays before 8 PM you can park your car for 30 Kč per hour using a parking meter or mobile app like	Mapy.cz or	eParkomat. Parking for as low as 20 Kč is possible in a large car park in Přímětická street (behind the salon towards the Severojižní magistrála), which is about 100 metres from our salon. See the	map to find the car park. Are you organizing a	golf tournament or a corporate event for major clients? Contact us and we will arrange Thai massages on site. You can be sure that every visitor will appreciate it and will remember your event for a long time. How about rewarding each of your employees with a short Thai massage treatment directly in his office or anywhere else in your company? Do you need to arrange massages for your hotel guests? Call us and we will arrange to	provide a complete massage service. Please fill in all mandatory (*) input fields. It's best to book by phone – just ring +420 774 121 113. You can call us anytime of the day. The company is registered in the Commercial Register maintained by the Municipal Court in Prague, Section C, insert 233284. Bookings, complaints, gift vouchers, general questions.